Brenda Shaw's poetry is always accessible. It throws up a canvas on which the poet paints her image -- of a time, a place, a person, an even, in bright, evocative colors. The reader does not have to struggle to find the "meaning" in the poem. Instead, one finds oneself leaping from one poem to the next, one image to the next, following a thread of narrative that lends excitement and anticipation. Truth is Shaw's muse. 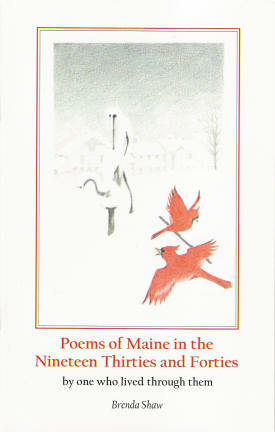 I admire these frank and uncluttered poems which honor and circle continuously back to her elders while they bring the Maine years out of darkness and "into the blazing light." Two women guard my bed and share my genes. a scientist, before she died young. who gave me art and anger. because I made their images with love and care. Mentora, grandmother, you made me strong so I could fight you. and the truth when I asked for it. Mentora and Shirley: I'll paint you both before I join you.